Oh, lordy, Sparky... I needed a laugh!! :lol: Thanks!! Patient: Doctor, I can't feel my legs. Doctor: Yes I'm very sorry, we had to amputate your arms. Sparky, have you heard this sweet little poem? ...and floated down the river. If you want one of those order it now--they sell out very quickly! I treid to get one for my brother a year ago and it was on backorder for months. Despite being a Monty Python fan he didn't find it very funny coming from me! Personally, I think it's hysterical and always crack up during that part of the movie. 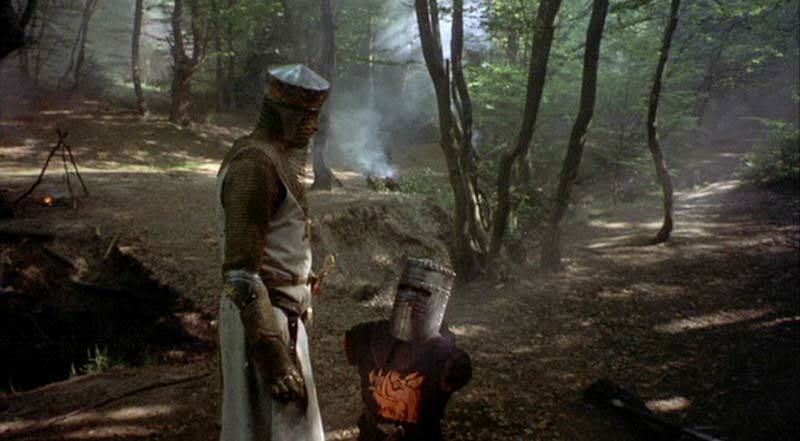 "It's just a flesh wound! Have at you!" And drink Budweiser right from the hollow. "Alright John, how you getting on today?" BWAHAHAHAHAHAHAHAHAHAHAHA - come back and fight you coward! Patient: "Wakes up" Where am I? Doctor: We had to amputate your leg. Doctor: I've got some good news and some bad news. Which would you like to hear first? Doctor: We amputated the wrong leg. Patient: Arghhh, that's terrible. What's the good news? Doctor: The leg we should have amputated seems to be healing very well now. The Black Knight - my hero. He showed no pain and just kept on fighting. "Oh, I see, running away, eh?! You yellow bar stewards! Come back here and take what's comin' to ya! I'll bite your legs off!" Quasimodo, the demented bell ringer of Notre Dame, put an ad in the papers for a assistant bell ringer. One man applied for the job but he had no arms. "How are you going to assist me?" asked Quasimodo. "That's easy!" replied the man and he ran at the bell and banged it with his head. "Sure!" said the man and he ran at the bell again but he missed the swinging bell and fell out of the bell tower. A crowd huddled around the hapless man lying in the street and a police office asked, "Does anyone know who he is?" "I DON'T KNOW HIS NAME, BUT HIS FACE SURE RINGS A BELL!" He then advertised the job again and hired the brother of the first assistant. "He's a dead ringer for his brother!!" A man goes to visit his 95-year-old granddad in hospital. "Fine," says the old man. "What about sleeping? Do you sleep OK?" "No problem at all. At 10 every night, they bring me a cup of hot chocolate and a Viagra tablet, and that's it. I go out like a light." The grandson is a little alarmed and goes to the head nurse. "I'm told you're giving a 95-year-old man Viagra with his cocoa on a daily basis." "Oh, yes," replies the nurse. "It works wonderfully well. The cocoa makes him sleep, and the Viagra stops him from rolling out of bed."